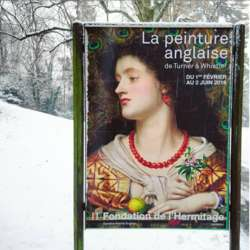 Fondation de l’Hermitage is one of the most picturesque museums in Lausanne, always hosting the most prestigious collections from around the world. It just premiered today an exhibition devoted to 19th century British painting from Turner to Whistler, taking in the Pre-Raphaelites. Whoever feel like it we can grab lunch afterwards at one of the very few open places in Lausanne - Le pointu, Blackbird, Etoile Blanche, Luigia.. We can decide then.